I was heavily into my Kirby phase when drawing “The Mark In America”. It tends to be more noticeable in the action sequence, which are relatively few in this mini-series. Look for it here in panel 3, mostly in the figure of Isaac who gets some “Kirby Squiggles” on various parts of his body as he fights off Burovnik’s goons. In some ways, the Kirby influence is more pervasive and subtle than those obvious surface mannerisms. For instance, how he did shadow placements in his mid/late 50’s period has made a big impression on me. I can’t point to anything precise; it’s more the realization that one doesn’t have to be accurate or do it “right”. What counts is creating a balanced effect and leading the eye across the panel and page. 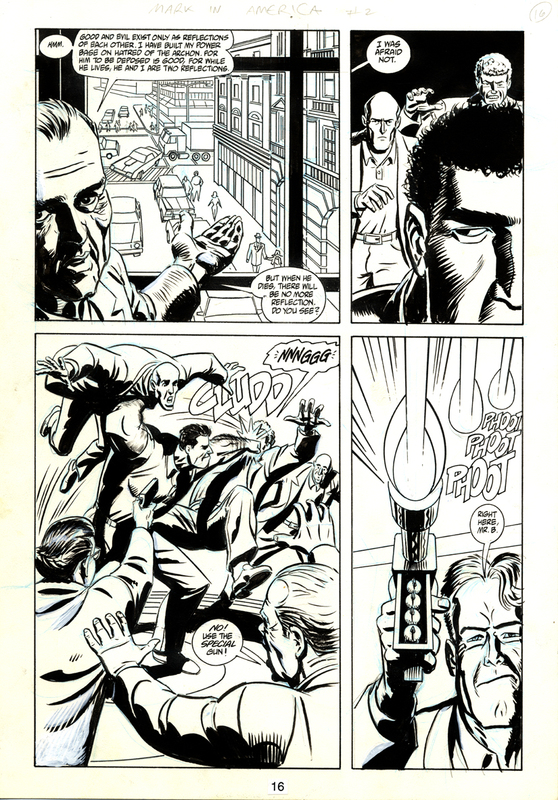 This is page 16 for "The Mark" issue 2, volume 2, otherwise known as "The Mark In America", published by Dark Horse Comics in January 1994. Written by Mike Barr, drawn by Brad Rader.